I’d recommend Best Wines Under $20 to anyone who wants fair and balanced ratings. I buy wine for about a dozen families plus a company. To date I’ve not had anything thrown back at me. 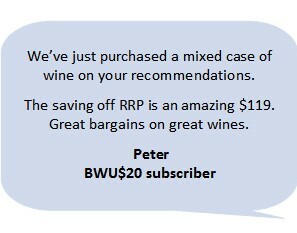 Your help is valued highly and considered a good bench mark.’ Peter C.
Best Wines Under $20 is just brilliant. Heading off to a wine shop armed with Kim’s list of Best Wines is fun, and the fellow who packed the wines up for me was pretty impressed with my choices. Fay Marie. ‘I continue to buy and taste on your recommendations and throughly enjoying the experience and to date, not one disappointment‘. Bill W.
Why not grab 4 weeks of our BEST BUYS WEEKLY mailer for free , and see some of what you’re missing.